Month: November 2016 | Sanctuary Counseling, LLC. It’s here! This weekend ends Daylight Saving Time (DST), and we “fall back” to standard time this Sunday, November 6th, at 2 a.m. So that means you’ll have an extra hour of sleep or an extra hour of whatever fun-filled adventure you have planned (of course only if you’re in an area that observes DST, some places don’t). Now I know it’s nice that we all “gain an hour” in the fall, but DST can have negative effects on us. So what does DST this time of year do to you and me? It takes most of us about a week to adjust to the DST change. The body tracks day-to-day behavioral and physiological events with light-dark cycles. This is known to as the circadian clock. The Monday after the time change, your circadian clock gets off track so it needs to reset itself, which takes days. Sleep patterns are also thrown off track with the time change. Quality sleep and enough sleep are both important for mental and physical health. Troubled sleep is linked to depression, memory and learning deficiencies, diabetes, heart disease, obesity, and it weakens the body’s ability to fight infections. As fall moves into winter, do you ever feel like the extra darkness and colder weather is affecting your mood? You’re probably nodding your head – I know it effects me. Getting enough sunlight is very important and this time change takes an hour of daylight from the afternoon, so that’s less time we can spend outside running, playing, exercising… whatever you like to do. The “sunshine vitamin” (vitamin D) can protect against many things, including osteoporosis, heart disease, and certain types of cancer. Not only that, sunlight helps with depression. Psychologically, shorter days with less sunshine combined with winter can lead to Seasonal Affective Disorder (SAD). 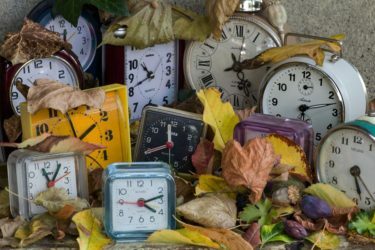 That’s probably more information than you really wanted to know about Daylight Saving Time. Anyway, there you have it. Enjoy your extra hour of sleep this Sunday night!